You know that we are urban dwellers. We live in the city, we play in the city, we love the city. However, we also love getting out of the city and into the true wilderness. Yes, there are plenty of gorgeous parks, beaches and ravines in our city, but the reality is we aren’t ever going to come across a moose…never. 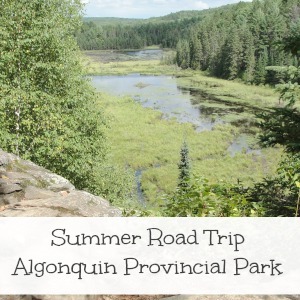 So, when we want to get away, away, away a beautiful spot to explore is Algonquin Provincial Park. 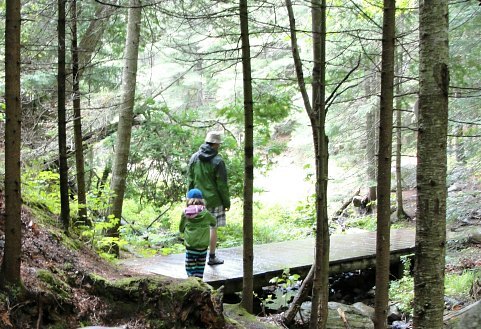 A summer road trip to Algonquin Provincial Park is totally doable, even with small children. Situated around 3 to 4 hours north of Toronto, the drive is the perfect length and there are plenty of service centres to stop at along the way. What awaits you and your family in Algonquin Park is well worth the “Are we there yet?” you will hear from the back seat. We’ve put together a list of a few of our favourite things to do while visiting Algonquin Provincial Park. 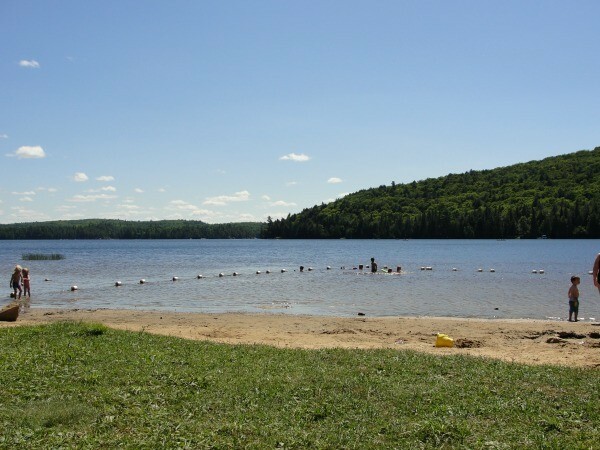 Camping If you want to camp at Algonquin Park there is one critical thing you need to know – book your camp site early. Our favourite campground is Rock Lake. There are over 10 campgrounds in the park, they all meet different needs of campers. Take some time to research the different campgrounds and pick the one that works for you. For instance, if you have an RV then your options narrow down to fewer campground and fewer sites. Not sure about tent camping and want to try living in a yurt? There are only a handful of yurts to be rented, again book early…like 6 months early. Not convinced that camping is right for you? There are three lodges within the park, they offer lovely facilities including cabins and fine dining. Visitor Centre Make the visitor one of your first stops, after to set up your tents. Inside the visitor centre you will find all kinds of information about the park. Find out about special events and daily programs for kids. The visitor centre also has a cafe, with free wifi. On rainy days, the centre is the perfect spot to take in a program or visit the museum. Not to be missed is the huge observation deck that overlooks the park. Bring your binoculars and look for moose. Speaking of moose, the visitor centre also has a huge board where visitors track what wildlife they see in the park…if you spot a moose be sure to add it to the list. Wildlife You really cannot talk about a trip to Algonquin Park without talking about the wildlife. There is no guarantee that you will see a moose, but odds are you will. When driving through the park, drive carefully. If you see a group of car stopped along the side of the road and the people are all outside, chances are they have spotted a moose. When we visited we saw a moose at the side of the road, happily eating a meal of grasses in a marshy area. It really is amazing to see a moose up close. Now, don’t get too close – it is important to respect all wildlife and teach our children to respect wildlife too. As for bears, well they live in Algonquin Park too. Head to the Outdoor Theatre one evening and learn about bears from Algonquin Park staff, during their interpretive programming – very informative and helpful. Junior Ranger Program Children 12 and under can take part in the park’s Junior Ranger Program. Pick up a Junior Ranger Activity Book to play and learn about invasive species in the park. Kids can also earn colourful buttons for being good park helpers. Lend a hand keeping the park clean and kids can collect buttons, my girls loved this program…the buttons make a great momento from the trip. Hike Do not forget your hiking shoes. No matter how old you are, how old your kids are, what your level of fitness, is hiking at Algonquin Park is a must-do activity. There is a trail that will meet your family’s needs…I promise. Take your kids on a hike into a gorgeous forest and discover beaver dams, gloriously tall white pines, explore a meteor crater, scenic water rapids and so much more. Water Take to the water. Algonquin Park has over 1500 lakes, 1200 streams and many more ponds and bogs. 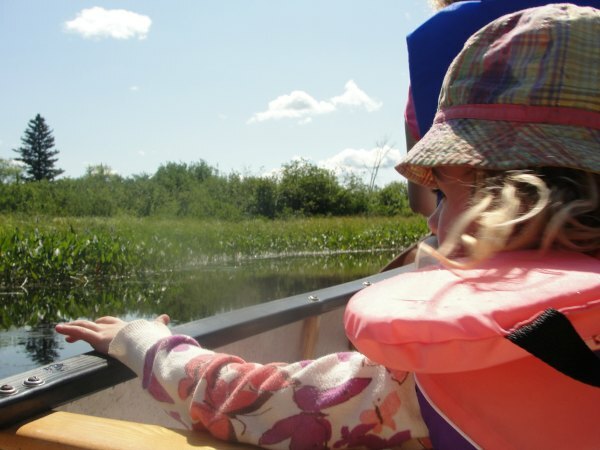 There are many ways that visitors can take to the water. Spend a day at the beach or rent a canoe. If you are interested in fishing at the park be sure to check the fishing regulations as there are various provincial and park specific rules to be aware of. The lakes are clear, clean and crisp – however there are no lifeguards on duty, so be prepared to supervise children at all times. Road Trip Tips Hitting the road with kids can seem overwhelming, but it really doesn’t have to be. My girls are grown now, but when they were younger they had two different road trip personalities – one would happily sit and look out the window and the other would scream her head off complaining. The good news is, we made it through those years and we still went on family road trips. How did we manage? I put together some of our favourite road trip tips in this Road Trip with Kids – How to Survive post. We also try and spend time outdoor on our road trips, check out our Simple Ways to Add Outdoor Play to a Family Road Trip post. Finally, as the kids get older the road trip challenges change (they don’t disappear) so we shared our 10 Tips for a Fun Family Road Trip with Tweens. 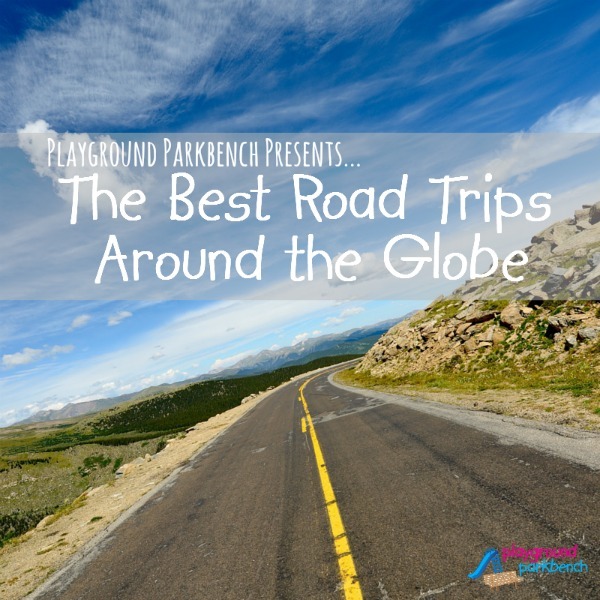 Today’s post is part of the The Best Road Trips Around the Globe hosted by Playground Park Bench. If you are heading out on a road trip this summer, check out this awesome collection of ideas from around the world…insider information about places to visit with your family shared by bloggers. This looks wonderful and I love how close it is to the city. We dream of visiting Canada my husband’s grandmother was born there and still has relatives that live there. One year we’ll make it.